Audiofile Engineering has launched Fidelia, a desktop music player created for Mac OS X. Rogue Amoeba recently updated Audio Hijack Pro to v2.9.7 and Nicecast to v1.9.12. MachineCodex Software has updated its media player, Neutrino, to v1.86. Rogue Amoeba has released updates for Audio Hijack Pro (v2.9.6) and Nicecast (v1.9.11). Fixed Noise has announced the release of Rhythm Objekt, a new Kontakt Player-powered sample library that is described as "a unique blend of sultry electro and urban in a 4 GB sound library package". 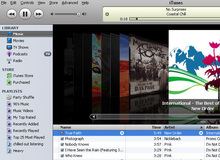 Rogue Amoeba has updated Nicecast to v1.9.8, which brings with it Mac OS X 10.6 (Snow Leopard) compatibility. iZotope has announced iDrum Beatboxing Edition, the latest addition to their popular line of iDrum Apps for iPhone and iPod touch. MachineCodex Software has updated AudioCodex to v1.48. MachineCodex Software has updated its media player AudioCodex to v1.4.